I love banana bread and whenever there are a couple of over ripe bananas, its baking time for me. I have made it umpteen number of times but the egg version. Nunu, my mother in law loves banana bread but I had to find an egg less version. The hunt began on the cyberspace and somehow the recipe by 4th sense cooking seemed the right one. And lo behold it was the one! It turned out perfect the first time and after that I made some and sent it off with Ajay all the way to India for Nunu. I love the texture, the colour and obviously the taste. All food fanatics, visit 4th sense cooking.com for exciting photos and recipes. The blog has amazing photos and you straight away get tempted to try out the recipes. 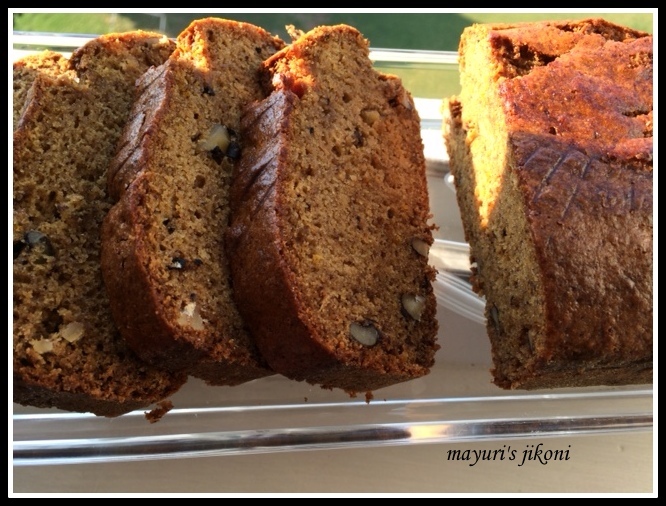 I am going to share her lovely egg less banana walnut bread recipe with you. I have made slight changes to the original recipe. I prefer adding a bit of salt to cakes and muffins to balance out the sweet taste. I also added 1 tsp of orange zest instead of vanilla extract. I chose to stick to the method that I am comfortable with. Goes well with a cup of tea or coffee, milk, hot custard, vanilla ice cream or with some cinnamon flavoured butter. Grease a 9″X 5″ loaf tin with butter. Line it with a greaseproof paper or dust it with flour. Sieve the flours and soda bicarbonate. Chop the walnuts and add it to the flour mixture. Add salt and mix the flour mixture well. Mash the bananas using a masher or a fork. Add sugar, milk, oil, yogurt and extract or zest to the mashed bananas. Whip it well with a hand blender or a whisk till it appears frothy. Add the flour mixture to the wet mixture and mix till the flour is wet. Do not over mix. Bake the bread for 40 to 50 minutes till it is done. Pierce a toothpick or a fork into the middle of the bread. If it comes out clean, the bread is ready. Take the tin out off the oven. Leave the bread in the tin for 5 minutes. Remove the bread and let it cool on a wire rack before serving. Coating nuts and dried fruits with flour prevents it from sinking to the bottom of the pan while baking. Its important to have the baking ingredients at room temperature. If you live in a hot humid place, store your baking powder and baking soda in the fridge. This bread sounds and looks awesome,and again it is egg less, I can give a try. Mayuri I am happy that I am making friends of the same profession in the journey of blogging.